Xinyi Li, Mahir Mahdee and Elizaveta Ozernova – three of the 100 plus holders of international master scholarships invited to the Vice Chancellor’s reception in the University Main Building. 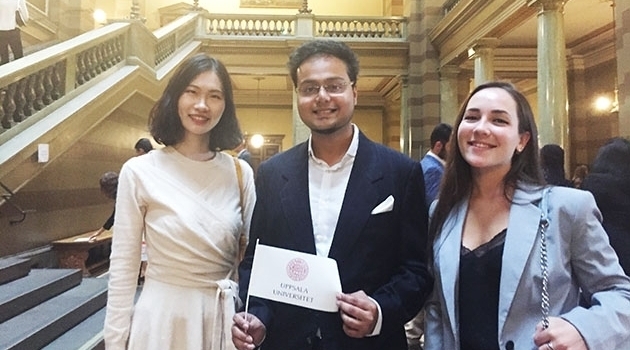 More than 100 new holders of international master scholarships were welcomed to Uppsala University at a reception with speeches and mingling at the University Main Building on 6 September. In recent years Uppsala University has taken steps to increase the number of international master students – partly through scholarships for students from countries outside the EU/EEA and Switzerland who must pay tuition fees. Without a scholarship it is difficult for academically outstanding but less well-off students who have to pay tuition fees to come to Uppsala. The scholarships, some of which come from foundations and private donations, pay for the tuition fees and give these students the possibility of taking a master programme at Uppsala University. This year a total of 109 international master students have been awarded scholarships to study on one of Uppsala University’s international master programmes. On 6 September all the new holders of international master scholarships were invited to a reception in the University Main Building. They were welcomed by the Vice-Chancellor Eva Åkesson and Svante Lindqvist, Foundation Director of the Anders Wall Foundation and the Beijer Foundation. A former scholarship holder, Blake Morgan, who received the Swedish-American Chamber of Commerce scholarship in 2017 and was also an exchange student at Uppsala University in spring 2016, shared his experience of his time as a student in Uppsala. Those who wanted to do so were also able to experience some of the University’s art treasures on a guided tour of the building after the mingle in the faculty rooms. The number of international master students at Uppsala University is growing steadily. The number of students admitted to the 50 international master programmes starting in autumn 2018 is 2,343 – which is an increase of 20 per cent on the 1,958 admitted last year. The number admitted in the category of students liable to pay tuition fees has also increased by almost 20 per cent from 1,249 to 1,494.